Take a guided tour of the RP-401R Digital Piano. With Roland’s highly respected sound, action, technology features, and build quality, the RP401R brings professional-level performance at a very attractive price. 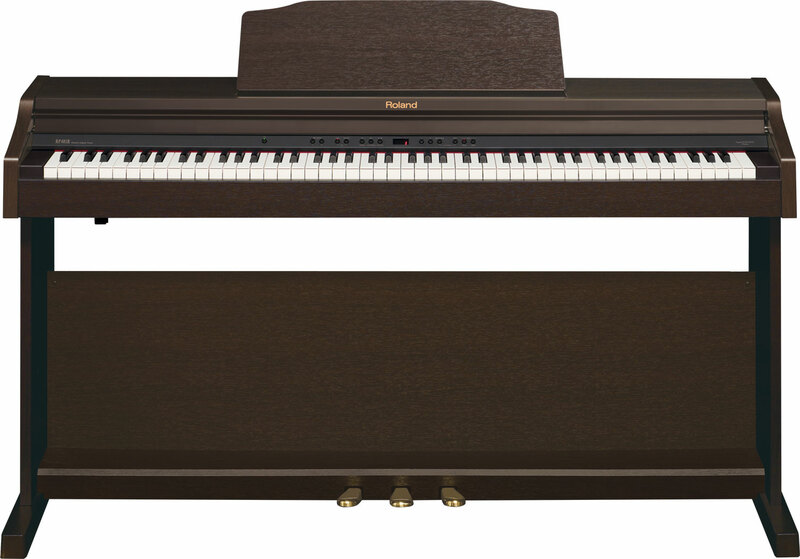 This handsome instrument is a perfect choice for a young family on a budget, or a piano educator looking for a quality instrument for their lesson studio. The compact design combines space-saving efficiency with traditional appointments, including an integrated music rack and a retractable lid that covers the keyboard when not in use. With your choice of Contemporary Black or Simulated Rosewood finishes, you’re able to select the right look to perfectly compliment any environment or decor. Thanks to its onboard rhythm function, the RP401R lets students play and practice music along with a beautiful backing ensemble. This helps build timing skills in a way that’s far more engaging than the standard metronome function, and also introduces them to the exciting experience of performing along with a full band. The RP401R’s rhythms are incredibly easy to use, providing intelligent backing that automatically follows the chords played on the keyboard. 72 different rhythm styles open players up to a diverse variety of musical genres, from rock and jazz to Latin, reggae, modern electronic styles, and many others. Playing with rhythms also offers a great opportunity to explore making music with the RP401R’s generous selection of non-piano sounds, such as organ, guitar, brass, synths, and more. Roland’s free apps for Apple iOS devices provide a unique way to motivate a child’s interest in playing and practice. With the Air Performer app, they can play along with favorite songs in the iPhone, iPad, or iPod touch wirelessly* through the RP401R’s sound system. The Piano Partner app for iPad includes Flash Card, an interactive music program that kids will love, plus an intuitive graphical interface for selecting tones, songs, and rhythms in the RP401R. Flash Card develops listening and reading skills in a fun way by challenging the student to identify notes shown on the iPad’s display and sounded from the piano, with awards given after five challenges. Piano Partner also includes DigiScore Lite, which displays the RP401R’s onboard songs as sheet music on your iPad. Available from the Apple App Store, these apps make it easy to use today’s mobile technology to energize a child’s piano development. For most modern families, the powerful digital technologies inside the RP401R provide numerous practical benefits over any acoustic piano. First and foremost, the digital RP401R never needs tuning and always sounds perfect, eliminating the annual costs that come with regular maintenance for an acoustic piano. 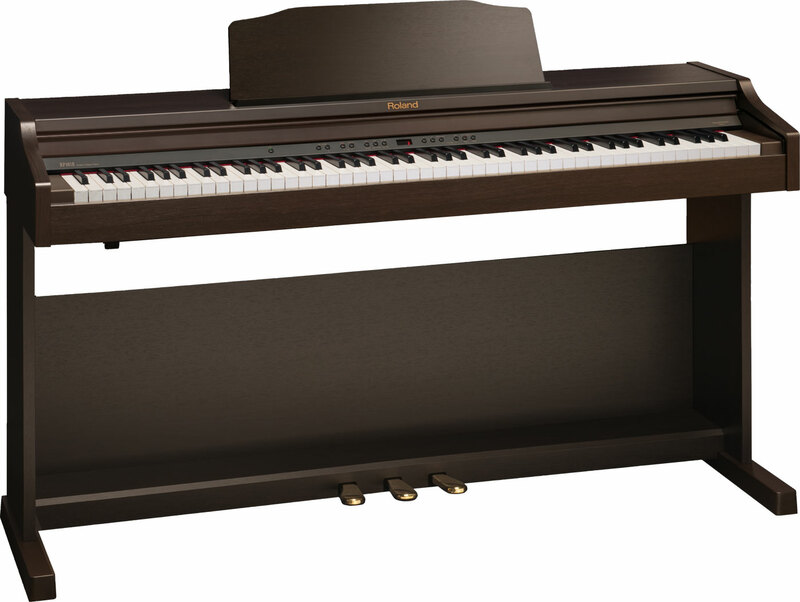 Convenient features for practice and fun include a built-in metronome, a recorder for capturing and sharing performances, and a Twin Piano mode that splits the keyboard so that two people can play side by side. You can easily adjust the volume of the piano’s speakers, and there’s even a Volume Limit function for setting a maximum level to keep your kids from playing too loudly. Another major benefit of a digital piano is the ability to use headphones to practice without disturbing others; the RP401R’s unique Headphones 3D Ambience effect greatly enriches the piano experience during these private sessions, making it feel as though the sound is emanating from the instrument itself.